I want to take the time to thank our wonderful residents and families, who continue to be our best advertisement. As I am out in the community talking with people, I hear that our La Posada families continue to rave about the care their loved one gets in our facility. Word of mouth is by far our best advertisement for La Posada Assisted Living. It has brought us several new residents that need our care. Thank you so much for spreading so many positive words about our facility I am truly grateful. We take our job very seriously and always want to strive for excellence. We recently celebrated with two of our residents who reached milestones in their marriages. 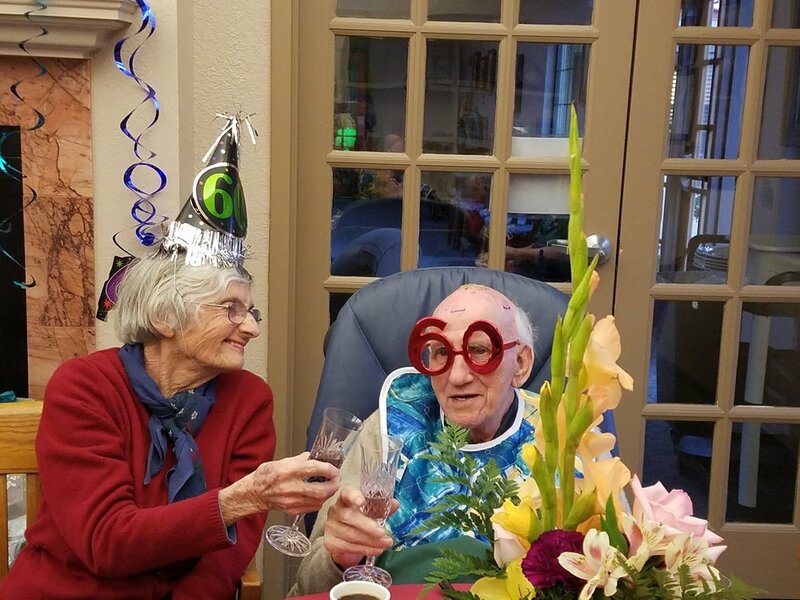 Late in February, Joe and Therese had their 60th wedding anniversary party here at La Posada Assisted Living. In March, the residents were invited to join with Arnold and Honey as they celebrated their 59th wedding anniversary. We congratulate both of these couples and wish them many more years together. As Activities Coordinator, I always try to plan activities that are meaningful and that the residents enjoy. Because of a survey I took after the first of the year and the popularity of our social hour, we now have social hour two times a week, on Tuesdays and Fridays. I have also reached out to some of our local talent here in Las Cruces and have found some musicians who are more than willing to perform for our residents. They offer a wide variety of musical styles that the residents enjoy. Along with our travel DVD’s, Saturday Matinees and the other activities planned throughout the month, my goal is to keep everyone engaged and give them something to look forward to. Family members are always welcome to join in any activity with your loved ones. With additions to our family, I want to remind everyone of a couple of things to make your visit here as enjoyable as possible. You can visit your family members anytime. After hours use the call button at the right of the door to let the staff know you are here. As soon as they can confirm who you are, you will be buzzed in. You are welcome to eat with your loved one at any of our meals. We do request that you let us know a full meal in advance. Meal tickets can be purchased at the reception desk during regular hours, after hours or on weekends please see the kitchen staff. If you watch KFOX, you will recognize Jean. She has become the face of La Posada Assisted Living in our advertising campaign. We are truly thankful to her for being willing to help us get the word out to the public about our assisted living facility. Inquiries are up as more and more people hear about us. We currently have 13 residents. All of the staff at La Posada Assisted Living wish you a happy and prosperous New Year! I wanted to take some time to wish all of our wonderful residents and their families a very Happy New Year. I also wanted to take some time to thank all of the wonderful families that have trusted La Posada Assisted Living with your loved ones’ care. I want you to know we do not take this job lightly, and we strive for excellence each and every day. As we bring in the new year together, I wanted to let everyone know that I am always open to suggestions for our Assisted Living Facility. I have an open door policy, so please come see me, or call for any of your needs or concerns. Thank you so much for being a part of our family here at La Posada Assisted Living. The holidays are gone, but not the memories. I want to take this opportunity to reflect on some of the events that made the holidays special for our La Posada residents. Thanksgiving is a special time here at La Posada. Our kitchen staff prepared a traditional Thanksgiving meal for our residents and their families. Over 60 people were served, and everyone enjoyed the meal and had a great time. On December 1st our volunteers arrived ready to begin the task of decorating for Christmas. After they had finished, everyone commented on how beautiful the decorations were. December also had many special activities for our residents to enjoy. We had several visits from local choral groups who came and performed. On December 20th we had a holiday cookie social. Invitations were sent out inviting everyone to bring their favorite holiday cookies to share. The response was overwhelming, and the result was that everyone had a fantastic time. The opportunity was also taken for the staff to present each resident with a personal gift. We kept our kitchen staff busy during the month of December. As a treat to our residents, three buffet style meals were planned for the first three Mondays of the month. The kitchen was also busy preparing special meals for Christmas Day, and for New Year’s Day. All of these meals received rave reviews by our residents. On January 5th Frank Lovato, our volunteer classical guitarist, returns after a leave of absence. He will be serenading our residents every Thursday at 11am. On January 12th the Cactus Chords will be performing at 11am for our assisted living residents. They are a barbershop quartet, and have received recognition for their work. On January 20th we will have an inauguration watch party in the morning. Refreshments will be served. February 14th is Valentine’s Day, and something special is in the works for our residents. I will keep you informed. Two new residents will be calling La Posada home this month. This will bring us up to nine residents. We still have rooms available. If you know of anyone that is looking for, or needs an assisted living facility, please let them know about us. We will be glad to discuss options with them and give them a tour.